Can you buy life insurance from web? Yes you can, our customer Keskinäinen Vakuutusyhtiö Kaleva (Kaleva Mutual Insurance Company) has had an eCommerce site for several years, henkivakuutuskuntoon.fi. During beginning of 2015 we helped them to set up a newer improved eCommerce site. 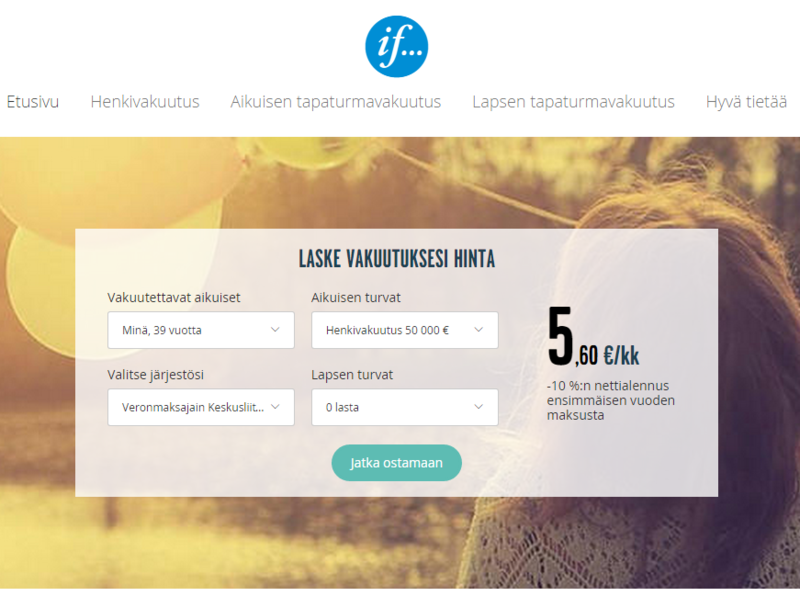 The site is for Finnish customers providing Keskinäinen Vakuutusyhtiö Kaleva insurances sold by If vahinkovakuutusyhtiö OY (If P & C Insurance). Since the name suggest (henkivakuutus is life insurance in Finnish) you can buy a life insurance for yourself. There are insurances for accident, medical expenses, short-term work disability, permanent work disability and for accidental death. After covering yourself you can cover your whole family. You can buy the insurances listed to your spouse and select same or separate insurances. For kids under 18 there is accident insurance package, covering medical expenses, permanent disability and accidental death without deductibles. You don’t necessarily need insurance for yourself, you can buy them just for your family, spouse and kids separately. There is one need though, you need a union or affiliated association membership. There are few associations for non-union members like Finnish tax payers association. We created the project together with Futurice. We did the project management and Futurice did the ‘heavy lifting’ i.e. development. This was an agile project, using scrum methodologies. Together we did the site from scratch. In addition to project management we did the analytics part too. From KPI setting and planning to actual implementation and analysis. How did the project go? The project was very successful. Building the site and launching it live went before schedule and under budget. Customers full ownership and high professionalism of everybody involved made this possible. The site itself sells insurances very well. Since the site was responsive from the start, there were no negative effect from Google’s ‘mobile-gate’ update. Having the best possible tools form Adobe Marketing Cloud ensures deep data integration from all channels used to market the eCommerce site. Tool gives full flexibility to change data gathering for analysis in short notice. If you want to get your development project in schedule and in budget or get your analytics and marketing in a completely new level, please contact us. Or send us an email. Oh, and the Futurice guys. They are very good. (I’m not kidding, they are).